We had about 15 people and we reserved only when a bunch of us after a big BBQ decided to eat more (I guess we didn’t have enough! ), at Boston, and called in 20 minutes before arriving, but they were able to accommodate us. Most people wanted a drink, rather than binge eat, and for some like myself who didn’t drink, their extensive selection made it a good choice. 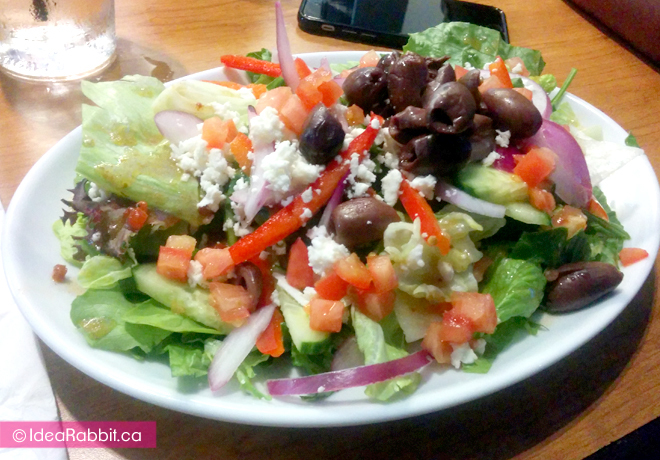 Sheepie ordered the Mediterranean Salad $7.49 with garden greens, cucumbers, red onions, red peppers, tomatoes, feta and Kalamata olives topped with tomato tarragon dressing. It looked pretty tasty. 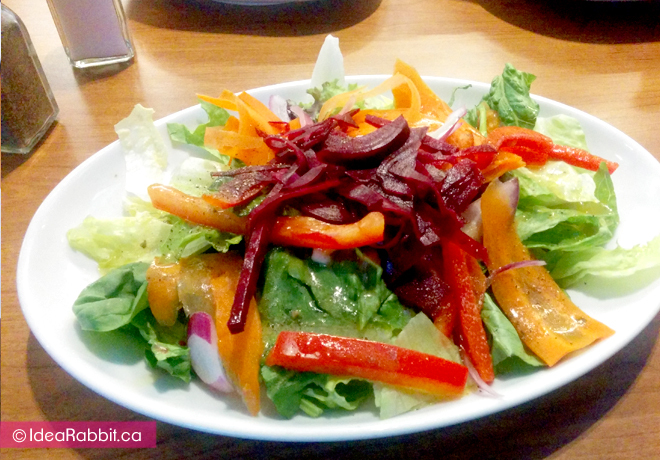 I ordered the Boston Pizza’s House Salad $6.99 with garden greens, red peppers, red onions, carrot ribbons, julienned beets in their citrus vinaigrette dressing. 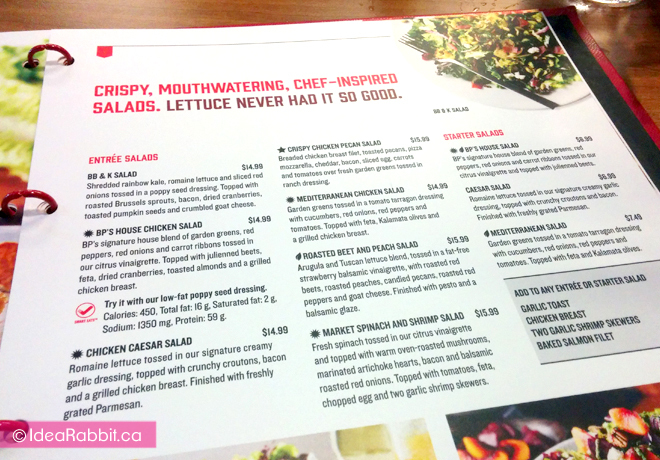 Being it their ‘house salad’, I was a bit disappointed in seeing that Sheepie’s Mediterranean seemed fancier. However, it was an alright salad. People at the table ordered Cheesesteak Cactus Cut Nachos $14.99 which we had a few bites of. It was tasty and addictive! Smoked Applewood seasoned Cactus Cut chips covered in mozzarella, cheddar, sliced BBQ steak, red peppers and red onions drizzled with horseradish mayo and green onions. 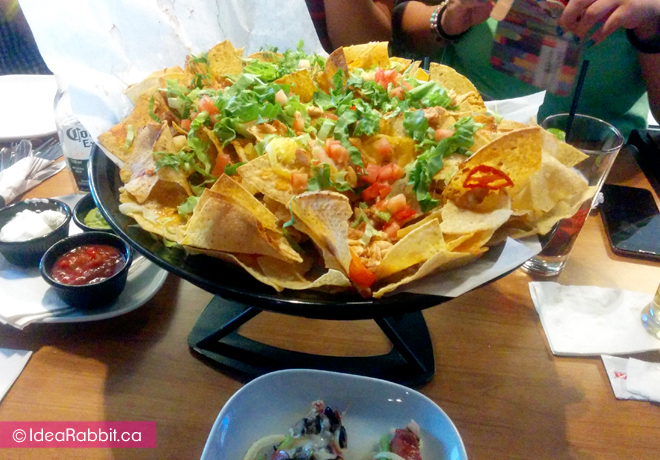 Served with salsa and our signature cactus dip. As this is best served right out of the kitchen, it is not available for take-out. As this is best served right out of the kitchen, it is not available for take-out. People who were more interested in drinking sitting on the other end of the table ordered the BP’s Fully Loaded Nachos (Serves 3-5) $18.99. 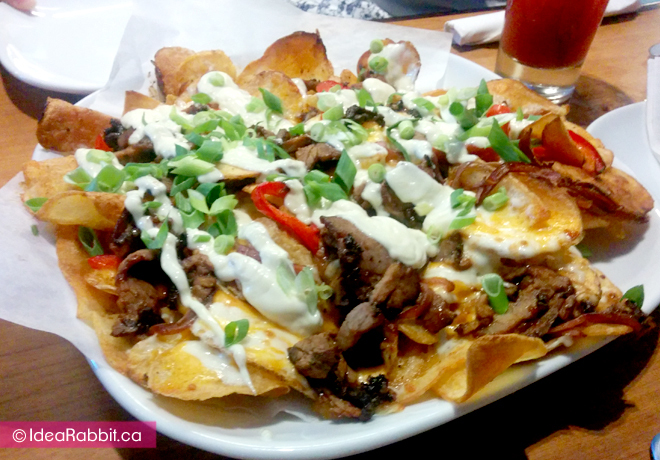 For the size and just $3 more than the Cheesesteak Cactus Cut Nachos, this is a better deal! It’s got chili lime dusted tortilla chips, pizza mozzarella, cheddar, nacho cheese sauce, banana peppers, tomatoes, red onions and a cilantro lime lettuce mix. Topped with your choice of chorizo sausage, seasoned beef, BBQ chicken or spicy chicken. Comes with salsa and sour cream. Again, this is not available for take-out. Service was great. The restaurant had a lively atmosphere, but not sports-bar rowdy. Great place for large groups! 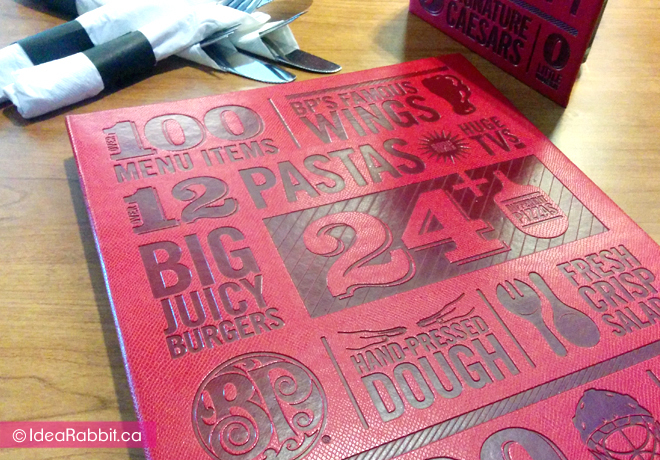 This entry was posted in American, Fast Food, Food, VANCOUVER and tagged bar, Burnaby, Metrotown, nanchos, pasta, pizza, salad, wings on December 1, 2016 by idearabbit. 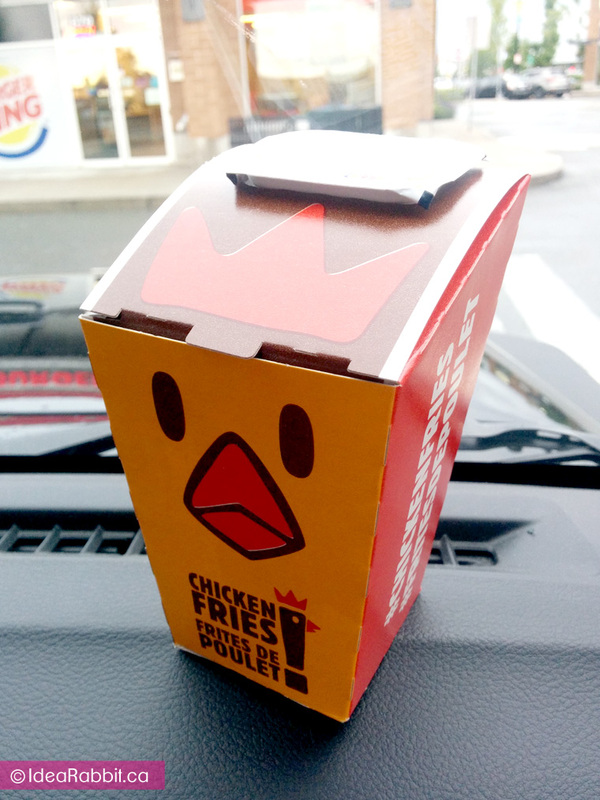 I’ve seen the cute chicken’s packaging, and been tempted to order them before. I finally did this time and ordered the Chicken Fries $3.99. The packaging is delightful (though not eco-friendly), with a compartment on the top to hold the sauce. (I had honey mustard). Even after you opened, it, there was a way to hold the opened packet of sauce. Not sure if I was using it right, but it did hold. The chicken fries on the other hand was a disappointment. It was hard, dry, and not much flavour unless you dunk a lot into the honey mustard sauce (or whatever you may order). It was pricey, considering you can get 5 good pieces of chicken nuggets for $1.89 at Wendy’s. The staff was friendly. The place was very clean, as there were no other customers dning during our visit. Would not order the Chicken Fries again. This entry was posted in American, Fast Food, Food, VANCOUVER and tagged burgers, chicken, fast food, junk food on August 29, 2016 by idearabbit. I’ve barely been to this mall, but was going to see a show later on, so my friend and I stopped by for a quick bite at the food court. Wow! I must say it’s a pretty impressive food court. 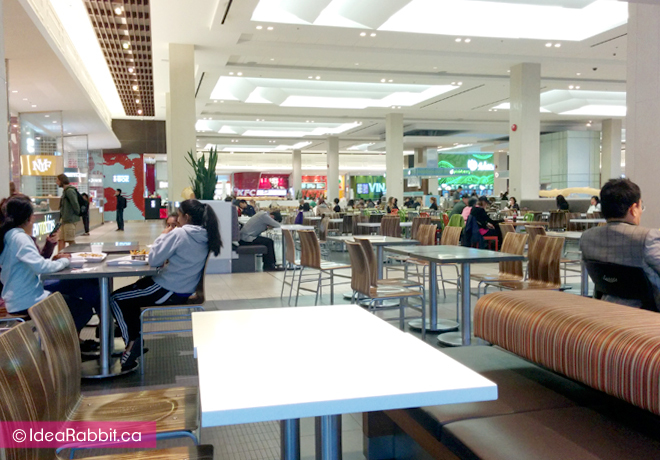 Very modern, clean, bright and higher-end then – let’s say Metrotown. I liked how the different venues had a cohesive design so that it wasn’t all random. It seemed to all work together, yet, each one was still kept it’s brand’s look. 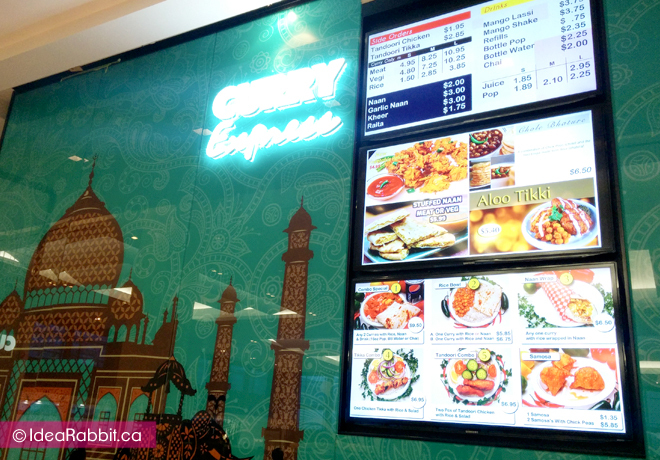 As with all other other Curry Express in mall food courts, the menu is the same. 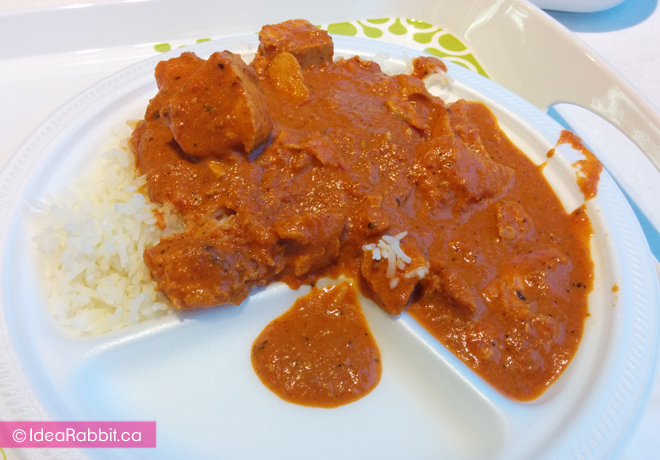 I got my usual Butter Chicken on Rice $5.95. It’s certainly not as rich as ones you would get in a sit down restaurant, but it’s ok. The chicken pieces this time were too large making it a bit difficult with the flimsy spoon to cut or hold while trying to take a bite out of it. I always find the portion a bit small, though it can vary slightly from who’s serving you. Service was satisfactory. 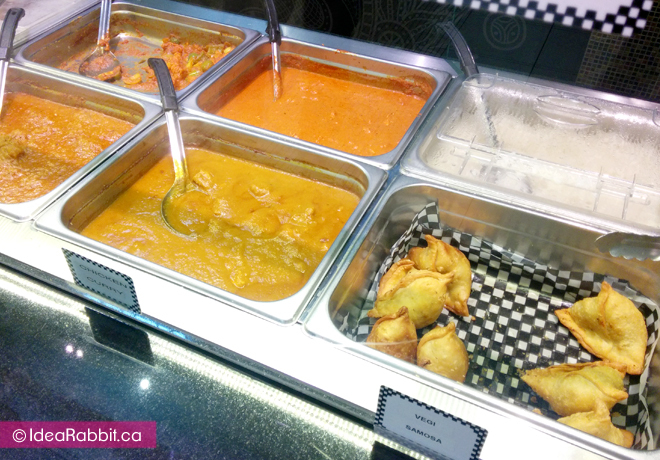 This entry was posted in Fast Food, Food, Indian, VANCOUVER and tagged curry, fast food, food court, Indian, mall, Richmond Centre on November 21, 2015 by idearabbit.